Our tourist home is ideally located between the quaint village of St-Jovite and the old village and resort area of Mont-Tremblant. Within a km. of our home you will find several restaurants as well as the petit train du nord biking/x-country path and a golf course. 3 bedroom (queen in ensuite, queen in 2nd and set of bunks in 3rd) 2.5 bath, sleeper sofa in open-concept living room. Dining Area seats 6, Breakfast Bar seats 4, TV, VCR, DVD and small library in entertainment center. furnishings combination of contemporary and Quebec antique; terrace with patio table and BBQ, 2 parking spaces, outdoor heated inground pool in season, fully equipped kitchen, linens etc. supplied. Internet, wi-fi, courtesy LD landline on calls to Canada and USA. Check-in is 3 p.m. or later on day or arrival, check-out at noon. We will be flexible if circumstances allow. A $200 damage deposit sent to owner required (not included on invoice). Check returned 2 days after departure. Bike lane in street takes you to linear bike path less than a kilometer from condo. 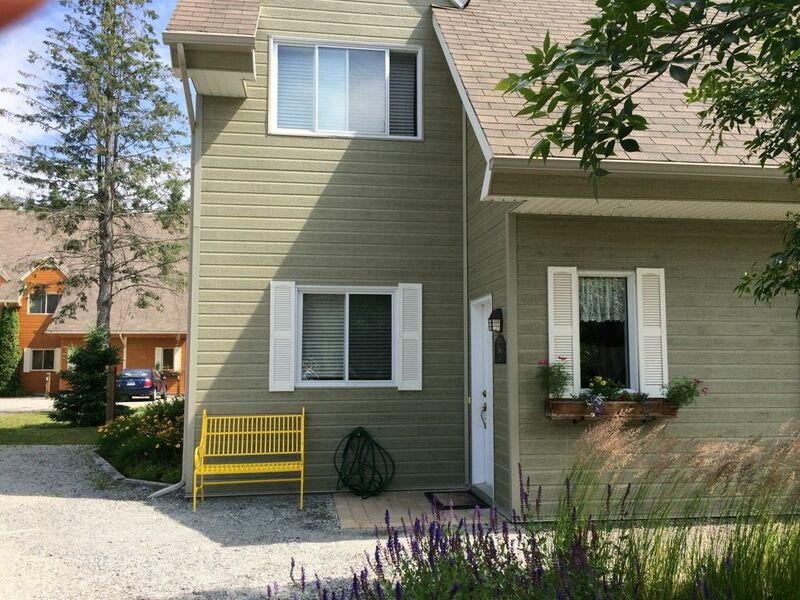 Great central location 2.5 km to center of charming St-Jovite, 8 kms to old village of Mont-Tremblant and 9 km to foot of Mont-Tremblant resort. Vary seasonally and with demand. Less than 30 days stay, a 3.5% tourism fee is added. Pedestrian/bike lane from our drive leads to bike path and into St-Jovite. 3 -NO SMOKING AND NO PETS. 4. Park in the two spaces to the left of our doorway. 5. Smoking of any type is NOT PERMITTED ANYWHERE WITHIN THE DOMAIN DU LAC DEVELOPMENT. The condo was perfect for our family of 6. Plenty of space for everyone. Short ride to Mont Tremblant ski mountain. Would highly recommend! Very clean, well laid-out and nice location. Some obvious attention was taken to make sure guest stays are comfortable... Thanks! We wanted something larger than the typical condo and not as expensive as most houses at Tremblant given there was only my husband, myself and my 2 kids. This worked out perfectly. We only stayed one night but the house was equipped perfectly for a longer stay. I would recommend this house to any families who enjoy a place off-resort and is looking for something with room. Went to Mont-Tremblant for the Mont-Tremblant Ironman race, and this place was perfect for the 6 of us. It was clean and well maintained, and also very spacious for us. Overall awesome place, I would definitely come back here, or recommend it to a friend. The owner was very nice and helpful. Very short drive to the center of the village.